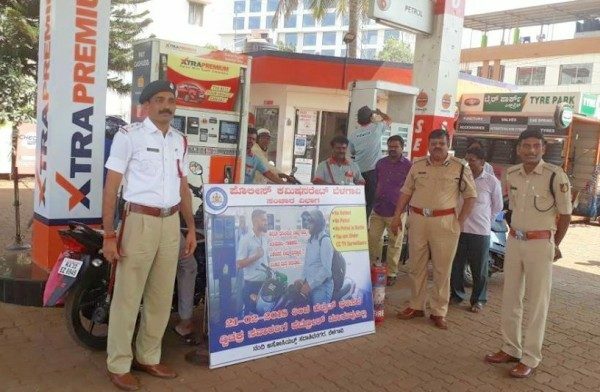 Commissioner of police DC Rajappa visited various petrol pumps today and assured that Fuel was been given to only those who wore a helmet. Those who did wear one were asked to wear and then get their vehicle filled. Petrol distributors have been asked to display the circular mentioning the ‘No Helmet, No Petrol’ campaign sent by the police department in every bunk. DCP Seema Latkar has assured the presence of one police constable in every petrol bunk to prevent the customers from getting into argument with the petrol bunk staff as discussed on Tuesday. Belagavi is the first to implement the ‘No Helmet, No Petrol’ model awareness campaign in the state of Karnataka. This campaign will start in the twin cities of Dharwad – Hubballi from February 22. As this was the first day things were quite smooth as usual. We will have to see if the same awareness is intensified in the days to come. People shall simply borrow helmet from someone in the line and then return back. Destined for failure. No petrol bunk owner will abide by this coz he could loose business…. Good Move,Citizens must know that its for their own safety. Its just a matter of time that some lawyer will file a case citing violation of rights of citizen , equal rights to access of commodities. On a lighter note. Policemen need not risk their lives stopping a helmet-less rider on road,they can stand in a corner and catch such people. Police are targeting the law abiding citizens. Instead they must educate the political parties and advice not to hold bike rally without helmet.